Microsoft, An Empire Under Siege, Makes Its Next Moves : All Tech Considered This week, Microsoft will roll out the largest upgrade of its Windows software in more than a decade. And for the first time, it's marketing a tablet, called Surface. Microsoft still commands a formidable computing empire, but it's an empire under siege. Microsoft CEO Steve Ballmer speaks at a Microsoft event in San Francisco in July. This week, Microsoft launches Windows 8, a radical redesign of its operating system, as well as a new set of tablet computers. Microsoft, the company that defined the PC, is still enormously profitable — but not as profitable as it once was. This week, Microsoft will try to regroup. It is rolling out the largest upgrade of its Windows software in more than a decade. All of this is meant to help the company break into the exploding market for mobile. While the company still commands a formidable computing empire, it is now under attack. Microsoft's CEO is Steve Ballmer, a big, bombastic, balding guy. These days he's riled up about Windows 8. "Windows is the backbone product of Microsoft," Ballmer said at the company's Worldwide Partner Conference in July. "Windows PCs, Windows Phones, Windows slates. Windows, Windows, Windows, Windows, Windows." But every time I've seen Ballmer speak recently, my mind wanders to Winston Churchill, who famously said: "We shall fight on the seas and oceans. We shall fight with growing confidence and growing strength in the air ..."
Ballmer is no Winston Churchill. He's not fighting Nazis, and he'll never win a Nobel Prize in literature. But like Churchill, Ballmer is a man who commands an empire that is under siege. 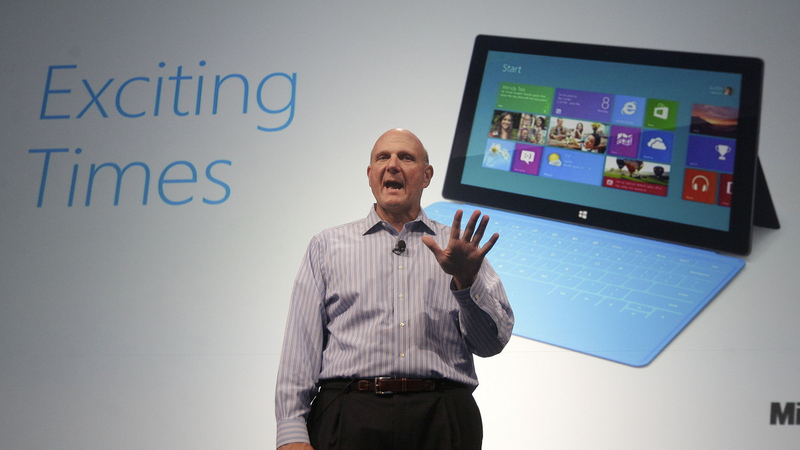 "The industry continues to move and change and advance dramatically," Ballmer said. But most analysts say Microsoft has not. Last quarter, the company's profits fell 22 percent. PC sales have stalled. And Microsoft has been left behind in mobile. "Microsoft always sees itself as besieged," says Joshua Shapiro, head of the technology consulting group Princeton Analytics. And right now Shapiro says it actually is besieged. "Google has gone after Microsoft in a very clear way, attacking Microsoft's major profit sources, which are the operating system and its office productivity suite," he says. Shapiro is talking about the programs installed on roughly a billion computers: Windows and Microsoft Office. "And Google has tried to essentially give away what Microsoft sells. So this is a huge threat," Shapiro says. But that's just the beginning. Shapiro and others argue that Microsoft has fallen behind on the most important technology trends of the past 15 years: the rise of the Internet and e-commerce, search and social. In mobile, Microsoft is years behind. Its new operating system, Windows 8, will work on tablets and with touch, and it's supposed to help it catch up. Charles Golvin, a mobile market analyst at Forrester, says Microsoft is actually facing three enormous, focused, well-managed adversaries: Google, Apple and Amazon. "This is a battle of ecosystems," Golvin says. "It's not a world of competition among devices. It's not a world of competition for communication services and media consumption." Instead, everything is rolled together. If you buy an iPhone, you're probably more likely to buy your movies and music from Apple, too. Ditto with Amazon's Kindle or devices running Google's Android. Microsoft — if it has a strategy — is probably trying to be a fast follower, Shapiro says. He says Surface, Microsoft's new tablet, is kind of like an iPad with an Excel spreadsheet. And then, Shapiro says, there's "the Microsoft version of the Apple store, and the Microsoft version of the Apple app store, and the Microsoft version of Apple design." The company is leveraging the fact that millions of us are required to use Microsoft products at work as a way to sell us products that are almost like Apple's. But both Shapiro and Golvin agree it would be a big mistake to write off Microsoft. "Their core products, Windows and Office, continue to generate a lot of revenue," Golvin says. Golvin says some of Microsoft's own innovations — especially in mobile phones — are now being imitated by its competitors. But the biggest reason not to underestimate Microsoft, Golvin and Shapiro say, is that this company is tenacious. Or as Churchill said: "We shall never surrender."